IT LOOKS like some outsider is continually forgetting that we Americans are a nation born with the smell of machine oil in our hair and that if we are crowded too hard we are liable to stop making electric refrigerators and pretty automobiles and devote all our attention to turning out the darnedest flock of airplanes, tanks, and battleships the world has ever seen. The first time this happened to us there wasn’t even a rusty musket apiece to go round, and foxy old Uncle Ben Franklin solemnly proposed— and the other party believed him!—that if we were to put up any fight at all we would have to equip at least one regiment of the Continental Army with bows and arrows. We were in the subcellar of unpreparedness if there ever was such a place, for there wasn’t a single power-driven lathe on the whole North American continent. Just the same, from the backwoods forges of the Green Mountains and from the Lancaster County hills of Pennsylvania there came an ever-increasing supply of long-barreled rifles so deadly that no person with a grain of horse sense dreamed of wearing a red jacket within 300 paces of the muzzle of one of those nasty things. Now once more a bad-acting outsider has forgotten that on no less than five important occasions in our history we have changed practically overnight from a nation of easygoing Yankee tinkers to a tough army of grim-faced sweating gunsmiths. Our present national defense program, in addition to providing us with a two-ocean navy and the largest and most powerful mechanized army necessary to meet any conceivable emergency, also proposes to supply the tools of defense to any good-neighbor country threatened by ruthless invaders. It is futile to attempt to appraise this Gargantuan defense program in terms of the billions piled on billions it is going to cost, for the keenest human intellect can not comprehend the magnitude of even one billion dollars. However we are warned by William L. Batt, Deputy Director, Division of Production, Office of Production Management, that Germany is now spending the equivalent of 20 billion American dollars per year on her war program and that we must be prepared to exceed that. Or, by way of comparison, the Panama Canal, which required ten years to build at a cost of approximately a half billion dollars, has long been considered one of the great man-made wonders of the world; but our present national defense program calls for the equivalent of the effort necessary to construct not one but 40 Panama Canals, not in ten years but in one year! How desperately unprepared was the United States for assuming this role as the arsenal for all good-neighbor nations is revealed by the fact that less than two years ago almost 70 percent of our metal-working machinery—on which this vast quantity of arms must be manufactured—was more than ten years old. Much of this over-age machinery has depreciated until it is now of little use to the national defense program. As every machinist knows, you cannot work to tolerances of a fraction of a thousandth of an inch on a worn-out lathe. To build a ponderous 28-ton tank, which has the outward appearance of having been hammered out by an angry blacksmith, actually requires hundreds of machine operations where errors of just one thousandth of an inch cannot be permitted. To complicate the problem further, the manufacture of machine guns, torpedoes, bomb sights, and airplane engines involves many machine operations where an excess error of one tenth of a thousandth turns an expensive part into worthless junk. All of which means that vital elements of the national defense program can be produced only on new machine tools specially manufactured to super-accurate dimensions themselves. This has created a frantic demand for what can be called the master machines of national defense, and our only source of supply is the American machine-tool industry which just missed mass bankruptcy by the skin of its teeth in struggling through ten years of depression. The last good year for the machine-tool industry had been 1929, when it did less than 200 million dollars worth of business. Orders slumped to less than 30 millions in 1933, and at fire-sale prices at that. Just a year ago the United States Government began to realize the gravity of its unarmed position in a world seething with wars of invasion. Official attention then was directed upon the machine-tool industry. Which is to say that overnight every maker of lathes, drill presses, precision grinding machines, gear cutters, milling machines— all metal-working machines needed for the production of defense articles — was asked to stoke up that idle boiler in his power plant and start building machine tools on a day-and-night working schedule. For the year 1940 the machine-tool industry boosted production from that all-time low of less than 30 millions to 400 millions, or an increase of 1,300 per cent! But this was barely enough to equip a few pilot lines for the production of defense materials in limited quantities. 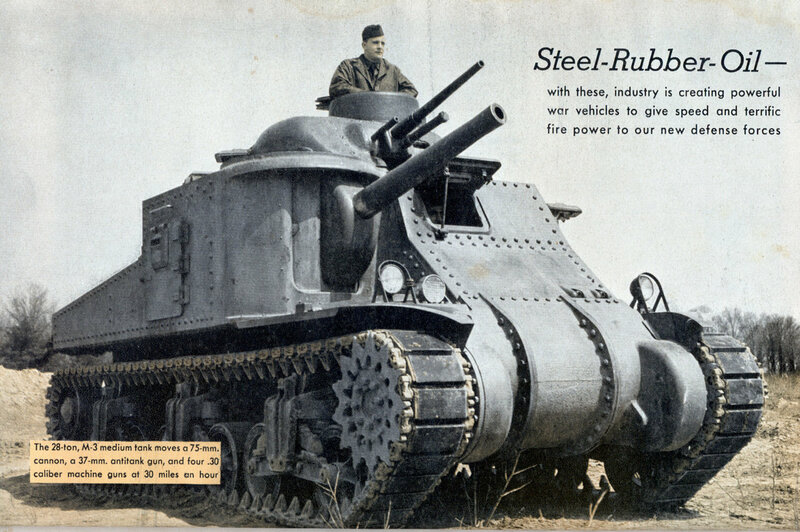 The industry was called upon to double production again and is well along to fulfilling its promise to supply 750 million dollars worth of desperately needed master machines for 1941. Plus—a two-ocean Navy, and 200 additional cargo ships! Big Bill warns that this is a full-time job for every skilled worker, for our best management brains employing our finest materials and requiring the erection of hundreds of additional factories. This job, he says, will require 28 billion man-hours of skilled labor during the next 28 months. “Every machine shop and every foundry in the United States which can make even a piece of something must be enlisted for the duration.” He might well have added, yes, and every basement hobby-shop enthusiast will be called upon to turn out small defense parts after his regular work is done. Many are the emergency methods being employed to provide an ample supply of skilled labor where it will be most needed. The U. S. Employment Service is calling for all workers outside the national defense program who have unused skill to register immediately at their local state free employment offices. This appeal was made especially to older men who had left their trades and who had become discouraged by traveling hit-or-miss about the country looking for work. Register at your local state employment agency if you are a skilled mechanic, is the advice right now. Then sit tight and a defense job will hunt you up. Public schools throughout the country are installing secondhand machine tools of the type most nearly like those used in local defense plants, so that unskilled workers can receive basic training and semiskilled workers can be graded up in skill. Y. M. C. A. night classes have been organized for the same purpose and many private trade schools are doing effective worker training. The National Youth Administration and W. P. A. are also conducting worker training courses. One of the interesting sidelights of the defense program is the manner in which newspaper editors have taken the reports of raw-material prices and supply off the inside back page and are now displaying them as page-one news. The “Big Six” of the raw materials these days are Rubber— Aluminum — Copper — Petroleum — Steel— Coal. These make the headlines because of the vast quantities of each consumed daily by the defense program. Steel, with its components coke, limestone, and iron ore, forms the backbone of the defense program, naturally. The job of moving iron ore from the upper Great Lakes ports is one of the really tremendous transportation problems of the world. More cargo tonnage passes through the Sault Sainte Marie locks in the nine months of the Great Lakes navigation season than is handled in 12 months by the Panama and Suez canals combined. Recently aluminum has made headlines on page one of our newspapers. The domestic demand for aluminum in a brisk business year used to run about 300 million pounds. The demands for airplane con- struction have increased consumption to 700 million pounds for this year, while the estimated requirements for 1942, when mass production of planes is expected to really get going, may run as high as a billion pounds. It is only natural then that aluminum was the next item after machine tools placed on the priorities list by the O.P.M. Copper, like aluminum, is needed in vast quantities for defense. It is used in the manufacture of electrical goods—wire, motors, power-plant generators—and soon will be in heavy demand as the base metal for brass cartridge cases. Domestic supplies of copper ore and smelting capacity are sufficient for almost any possible need. Petroleum is worrying the Axis partners far more than it need worry us with our almost unlimited supply, which is to be available not only for ourselves but for all other nations eligible under the Lease-Lend Act. Germany and Italy are being forced to carry on the aggressor’s burden of the war with only five percent of the petroleum products, both synthetic and natural, which the United States is now producing. The Axis partners are especially short of 100-octane gasoline, of which we have an abundance and with still more refining capacity being built. This 100-octane gasoline means that a supercharged airplane engine designed for use with it will deliver 20 percent more horsepower than another engine using 90-octane gasoline. It so happens that 90-octane gasoline is the best Germany so far has been able to produce, and then in such limited quantities that only careful rationing, to the utter exclusion of nonmilitary consumption, keeps her war machine from stalling. Dr. Robert E. Wilson, petroleum expert of O.P.M., recently made this report to a congressional committee: “The gasoline consumption of Germany during the few weeks of fighting in the low countries and France exceeded the entire consumption during the entire first World War.” Yes, our petroleum and 100-octane gasoline production is critical—for Germany. Other raw materials are being carefully husbanded by the materials division of O.P.M. We use annually more than 500,000 tons of chromium ore in the manufacture of stainless steel, high-speed steel, and special steel for ball bearings and nonshrinking die steels. A large part of this tonnage of chromium ore is used without metallurgical refining in the production of firebrick for steel-melting furnaces. At the present time most of our chromite ore is imported from Africa and the Philippine Islands, over trade routes that may be interrupted at any moment. But a year’s reserve of high-grade ore, over and above current arrivals from abroad, gives us sufficient leeway to develop American low-grade chrome-ore deposits and expand our existing ore-treating plants. Curtailment of our tin supply, which comes from British Malaya and the Dutch East Indies, is also possible. But here again we have created a reserve to last a year with careful rationing. Meanwhile our South American neighbor, Bolivia, is providing us with 18,000 tons of ore per year. The greater part of the 90,000 tons of tin we import annually goes into the countless millions of tin cans used by the food-canning industry. New lacquer coatings for untinned sheet steel have proved adequate as a substitute on food containers. Glass is also available—as the farm wife well knows —as a substitute for tin cans, and at slightly higher cost silver could be used. It is estimated that the cost of a can of tomatoes would increase not more than three cents if packed in a silver-plated can—extra for engraving your initials, of course. Since every metal-working machine must have efficient cutting tools, tungsten also has become a strategic raw material. Highspeed tool steel requires 18 percent metallic tungsten to make it able to peel off red-hot steel chips without losing its temper. Most of the 500 tons of high-grade tungsten ore we import per year comes out over the long and tortuous Burma Road from the interior of China. This source may be cut off at any time, as it recently was when the Burma Road was closed temporarily. Our reserve supply is almost nil, aside from what highspeed steel scrap is in the hands of scrap-metal dealers and the steel mills. We have a five months’ supply at best, but again fortunately we have a substitute. This is molybdenum. One mountain in Colorado can supply all the molybdenum we will ever need as a substitute for tungsten in highspeed steel. Another development of metallurgy has provided an even more efficient cutting metal than tungsten steel. This is tungsten carbide. Small bits of tungsten carbide when welded to less expensive steel shanks actually cut metal faster than 18-percent tungsten steel, and also hold an edge much longer between regrindings, thus saving at least 20 percent of the time a machine is idle while tools are changed. The really important feature of tungsten carbide, however, is the fact that one pound of tungsten carbide releases 100 pounds of precious metallic tungsten for the more essential defense needs— such as tips for armor-piercing shells. Some 72 raw materials are essential to the national defense program, with now and then a material like magnesium—a metal lighter than aluminum and now being used in increasing quantities for airplane-motor castings—making the headlines for a day or two, only to be forgotten by the public as soon as it learns that a new magnesium plant just recently erected on the Gulf of Mexico is tapping the unlimited reserves of this metal in sea water! Zinc will be mentioned in connection with what agriculture is contributing in the way of raw materials for defense. There still remain to be mentioned antimony, industrial diamonds, manganese, nickel, beryllium—a new metal employed in hardening armor plate and for machine-gun parts—cobalt, graphite, asbestos, cotton, mercury, and so on down through the list. In none of these materials could a serious shortage arise. 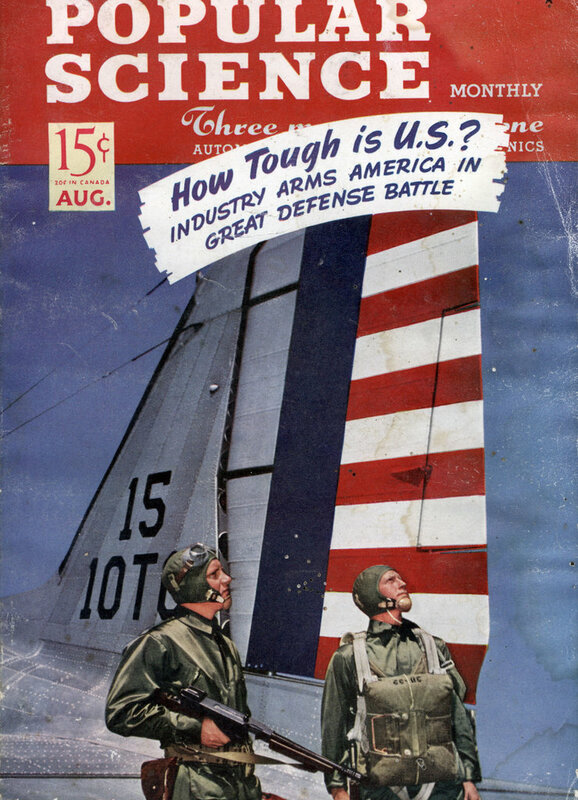 Of all defense raw materials obtained from distant foreign sources, “rubber” is the fighting word that would instantly send the United States battle fleet steaming westward with its decks cleared for action at the first authentic news that some enemy power was intercepting American merchant ships laden with crude rubber. Our annual consumption of crude rubber is something near 700,000 long tons, mostly imported from British Malaya and the Dutch East Indies. This supply may be cut off at any time. Meanwhile the best minds studying the rubber problem are busy devising a second line of defense, should our supply of crude rubber from the Orient fail. Excellent synthetic rubber products are being made in limited quantities from petroleum and various gases in combination with other elements. Synthetic rubber production at present meets less than two percent of our minimum requirements, while 3,000 tons of guayule rubber, extracted from a shrub that grows wild in Mexico and our own Southwest, and about 20,000 tons from South America constitute our only other sources of crude rubber. It is obvious that our rubber problem would be serious, if not critical, if it not were for the fact that in the junk yards of America and hanging from nails in almost every private garage, there are hundreds of thousands of tons of reclaimable rubber in discarded automobile tires. Chemical and mechanical processes now can extract this scrap rubber and restore it largely to its original state of usefulness. Paul W. Litchfield, chairman of one of the largest rubber-processing plants in the world, estimates that from these garage nails and junk piles a two years’ supply of vitally needed rubber can be reclaimed. Don’t be surprised some day to hear a voice over your radio asking you to go out to the garage and unhook that old tire from the nail and turn it in as your personal contribution to the national defense program. The defense role of chemurgy, the new science of converting farm products into industrial materials, is described elsewhere in this issue. From soybeans it makes plastics that will release much-needed zinc for the manufacture of cartridge-case brass. Soybean oil will yield stearic acid for use in the manufacture of tires and to increase the supply of glycerin for explosives. So the farm tractor may well be considered as enlisted for national defense, side by side with its tough big brother the 28-ton tank. Machines and raw materials are vital to the national defense program. But it is manpower—the manipulation of machines and processes by skilled hands and intelligent brains—that must be counted on to build the complicated weapons we need. Not much over two years ago a skilled mechanic over 40, unlucky enough to be out of a job, was considered all washed up and with no future but a pick-and-shovel job on a relief project. All that has been changed by the national defense program. Recently the manager of a large saw works producing lightweight armor plate for fighting planes pointed out to a visitor a giant plate-edging machine being run by a spry old man. Other surveys indicate that to meet the peak still to come an additional 4,000,000 skilled men will be needed. The training and morale of this vast army of defense workers is already recognized as being of equal importance and worthy of equal praise to that of the men in uniform. A nation of 130 mil-lion free people has spit on its hands and is tackling the problem of building an overwhelming stock of all the tools of war.